Dixie Dave joined his first major band in 1997 playing bass for Buzzov•en, he was on a few official releases, including the 1998 full length "...At A Loss". When Buzzov*en folded in 1999, Dixie started focusing more on the side project he created in 1998, Weedeater where he was vocalist/bassist and being it was his own band he had far more creative control. Weedeater would eventually become his full time band. 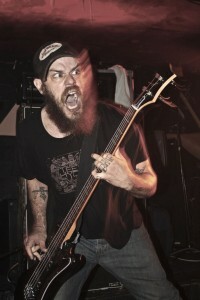 After two releases (...And Justice for Y'all (2001) and Sixteen Tons (2002) and touring mainly with Weedeater, Dixie joined Bongzilla, and recorded bass on their fourth full length release "Amerijuanican". In 2006, he formed Hail!Hornet with Erik Larson, Vince Burke, and Troy Medlin. They remain active to this day, and have two full length releases to date. He joined Sourvein briefly and recorded bass on the 2008 "Ghetto Angel" EP. As of 2010, the Buzzov*en "...At A Loss" lineup is back together, and Dixie recorded on the "Revelation: Sick Again" full length. He continues to tour and write with Weedeater, releasing two other full lengths (God Luck and Good Speed (2007) and Jason...the Dragon (2011) releasing four albums in all with them to date (mid-2013). In early 2010 Dixie Dave accidentally shot off a big toe whilst cleaning his favorite shotgun. He loaded a shell in the gun a few days prior to the incident to shoot off for New Year's, but he passed out, never shot it, and forgot about loading the gun entirely. Days later, cleaning the gun, he had it pointed towards his toe, and he pulled the trigger. The blast blew his toe off and put a hole in his living room floor. The incident postponed the recording session for Weedeater's "Jason...The Dragon", and pushed back a small tour. Weedeater referred to that small tour as the "nine-toe" tour.